As mentioned earlier, there have been doubts expressed about the letter presented by Situ Rinpoche on March 19, 1992. Is it the authentic testimonial letter of H. H. the 16th Gyalwa Karmapa? Unfortunately, we only had a copy of the letter, not the original. Nevertheless we examined the copy to see what might have brought about these doubts. Some seem to suspect Situ Rinpoche of having written the letter himself, so we included in this analysis some of his letters available to us. In several places the text seems to be damaged by humidity. Traces of a vertical fold can be seen in the middle of the paper. Horizontally the letter seems to have been folded in at least three places: below the third and the eighth line of the text and above the seal. This last fold can also be deduced because traces of the seal are found above it. The signature on the letter is almost entirely covered by the seal. From what little was visible on our copy, the signature seems to be different from those we found on H.H. the l6th Karmapa’s letters. This impression is strengthened when the signatures are, superimposed by computer. We found different letterheads on H. H. the Gyalwa Karmapa’s letters available to us. On several examples the emblem in the middle (two antelopes and the dharma wheel) was the same as document DocT27 (shown below). In some cases, it was multicolored, in others monochrome red. On most of the letters however, one could see the more elaborate emblem also used in the letter. Sometimes the words His Holiness the Gyalwa Karmapa’ were written in italics as shown in Doc T27. in other cases, these words and the address were lightly italicized, In a few instances the words ‘His Holiness the Gyalwa Karmapa’ were written in the middle of the page, just below the emblem. • In no case did we find the words His Holiness the Gyalwa Karmapa’ printed as in the letter, where the distance between the words is unusually big. • In The Prediction Letter the words “His” and ‘the’ are not in line with the rest of the text. The characters themselves in the letter are different from those in the Karmapa’s original letters. Especially the letters ‘S’ as in ‘Holiness’ and ‘P’ in Karmapa are broader in the letter’s letterhead than in any of Karmapa’s letterheads. The authenticity of this letter, as you all know, has not yet been established. Topga Rinpoche in his speech earlier today spoke.of doubts. I’d also like to say a few words about it. For example, the seventh sentence in this “prediction letter” says: ‘He will be born in the Earth-Ox- Year “. If Ogyen Trinley had been born in the year of the Earth-Ox, it means that either he would have to be thirty-two years old when the late Karmapa passed away, or he would be born twenty-six years after the death of His Holiness, the late Karmapa. These are the only two possibilities. For a person who knows the Tibetan calendar, this is obvious. If the “prediction letter” is claimed to be authentic, the predictions couldn’t pertain to Ogyen Trinley. If we go on to look at the geography of Tibet in relation to the instructions in this “prediction letter”, it says: “From here to the North… ” (“From here ” presumably refers to India) “… in the East of the Land of Snow… (Tibet). Urgyen Trinley’s birthplace is not in the far eastern part of Tibet but in the south-east. To those involved in the events surrounding the appointment of Urgyen Trinley, it became evident that these instructions did not tally with reality. In 1993, therefore, National Tibetan Radio broadcast a new version in which these mistakes have been rectified. The “prediction letter` broadcast on Tibetan Radio said that Ogyen Trinley was born in the south eastern part of Tibet and not in east Tibet. The radio commentator went on to say that he was born in “the good Earth year”, as part of the new version of the “prediction letter”, leaving out the astrological sign of that year’s animal because of the discrepancy. Moreover, scrutiny of the first sentence in the so called “prediction letter” in the light of the different schools of thought in Buddhism again raised certain questions. This sentence reads: “Self-awareness is at all times a blissful state”. Does this self-awareness refer to the Sautrantika school of Buddhism or the Mind Only school of Buddhism, or is it the self-awareness that the Madhyamaka school of Buddhism refutes? The second sentence speaks of a state free from mental fabrication, free from reference points. These two sentences contradict one another. The first sentence asserts the existence of a blissful state of mind, self-awareness; the second sentence speaks of freedom from mental fabrications (positing the existence of self-awareness is a mental fabrication). If one considers the contents of the alleged “prediction letter” from these different points of view, it becomes rather difficult to believe that the letter is authentic. Furthermore, analysis of the letter’s composition shows it to be quite unconvincing: the composition is very poor from a linguistic view point. 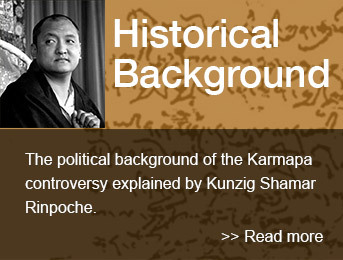 This issue has been discussed at length in a publication entitled The Karmapa Papers. However, it’s always a good idea to carry out an investigation. What is more, the Karmapa’s seal and his signature are smudged. Situ Rinpoche claims that this is because he’s been wearing the piece of paper around his neck for a number of years and the sweat of his body has caused the smudging. However, other parts on the same piece of paper are not smudged. Moreover, the envelope in which it was kept bears no traces at all of the sweat. Even a simple investigation of the purported “prediction letter” will probably bring to light clear evidence that it cannot be authentic. It would be rather odd if a letter inside an envelope has been partially soaked by the sweat of somebody’s body but the envelope hasn’t been soiled.